Tell me about the Million Gallon Challenge | Wyatt Irrigation Supply, Inc.
Our Goal is to help people conserve water, track the data and reach 1,000,000 of savings this growing season. How will we do it? Promote Laundry to Landscape, by diverting appropriate rinse water to the landscape rather than the sewer system. Take feedback and share ideas from our supporters. So how do you benefit? Participants are eligible for 1 free emitter for every 10 square feet of turf removal with a limit of 60 emitters when you purchase a conversion kit. What we need, your name, your zip code and the square feet amount that you will be converting, this helps us calculate the savings. What is in a typical kit? A collection of typical items needed when converting from sprinklers to drip, sprinkler caps to cap off unused sprinklers, conversion kit to change a sprinkler head to a drip system application, numerous parts to make typical connections. 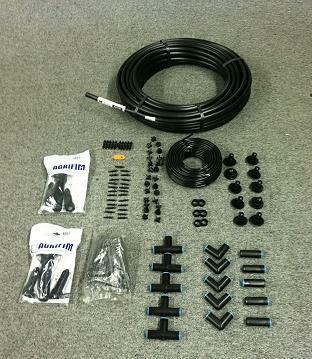 See attachment for a photo of a typical kit set up. How can I get involved to help in my community? Visit our community partner Daily Acts to see the great efforts they have going on to create a better world. I have questions or ideas on how I can help, who should I contact?